Add mounting hardware ($3): No Thanks. 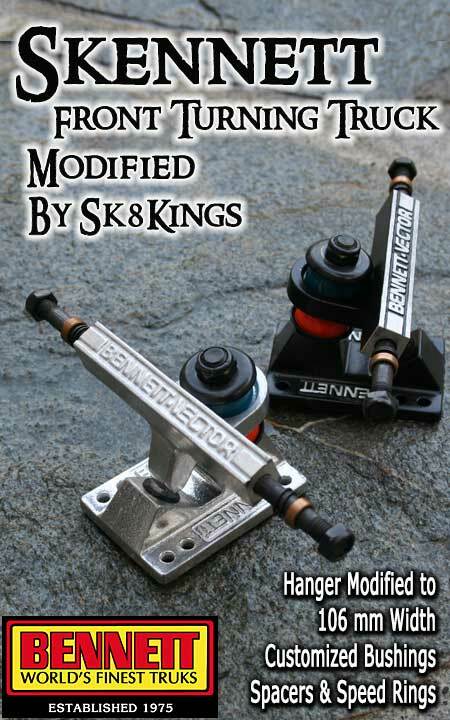 1.25" 1.75" 2.00" 2.50" 3.00"
Customized Bennett Vector Trucks with turning performance in mind. The Skennett modified turns on a dime and will take your standard set up to a new level of quick turning performance. After a little nip & tuck mod to the hanger, complete bushing overhaul and pivot lube -- these babies are the bomb for your front turning truck. Mod'd hanger width is 106mm with machine-milled face finish. Overall axle nut to axle nut measurement is 177.8mm (using the top quality original Bennett 4.3 axles). Comes equipped with speed rings and customized bushing combo (selections from Khiro and Tracker bushings). Specify weight and intended discipline in notes section when ordering. Note: This is not an offset truck and is specifically intended to perform as a super turny front truck. Makes a great matchup with the following rear truck solutions: our Skandal (mod'd Randal), Sk8Kings 2X Truck (offset) or the Tracker RTS. Styles available: Silver finish or black subject to stock availability. PREMIUM BUSHINGS: Highly recommended upgrade option. Choose Premium upgrade (combos from Venom and Reflex bushings). Please provide the rider's weight and intended discipline in the notes section when choosing this upgrade option.